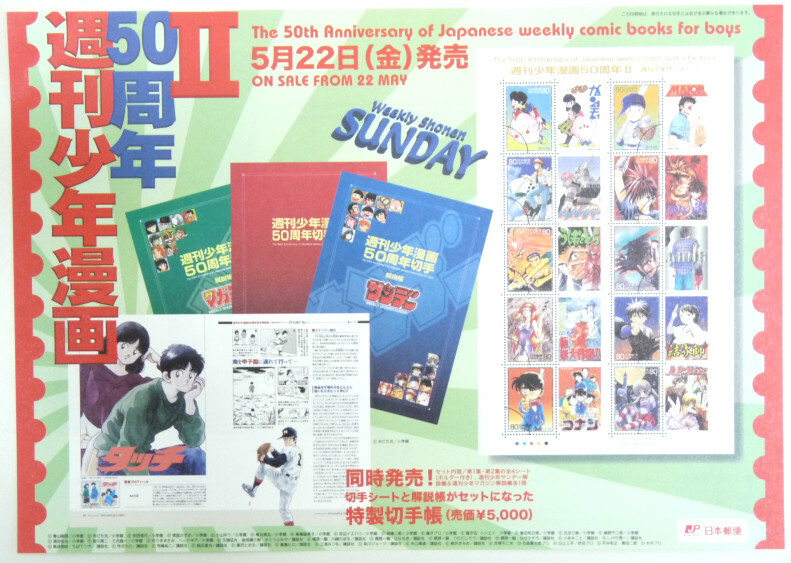 The second commemorative stamp sheets celebrating the 50th year of weekly manga magazines Shonen Sunday and Shonen Magazine came out on May 22, 2009, following the first ones released in March. 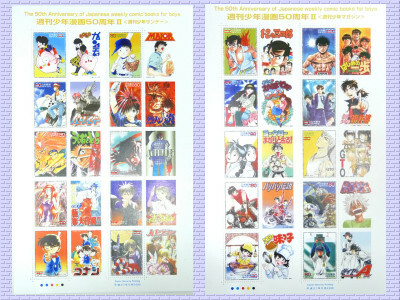 The mangas featured this time includes popular titles such as Case Closed, Kindaichi Case Files, Hayate the Combat Butler, Mobile Police Patlabor and so on. 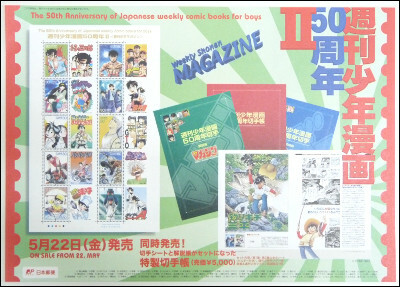 Flyer of the Shonen Magazine stamp sheet. Shonen Sunday version. Also released is a special album containing all four stamp sheets with booklets introducing the mangas, for 5,000 yen. 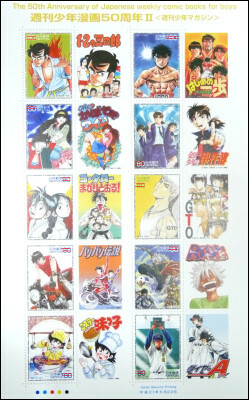 Let's first take a look at the Shonen Magazine stamps. 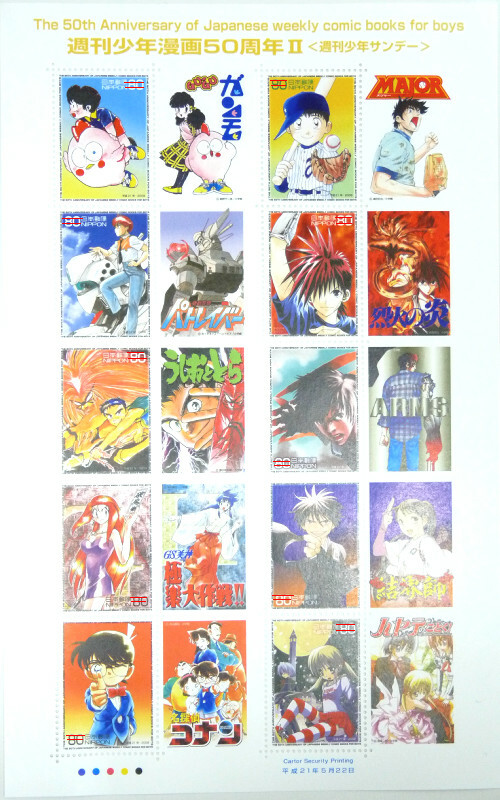 Ten 80-yen- stamps, each accompanied by illustration on the right. Ichi Ni no Sanshiro(lit.Sanshiro of 1, 2) by Makoto Kobayashi(left) and Fighting Spirit (right) by George Morikawa. The Kabocha Wine and Kindaichi Case Files. Kotaro Makaritoru! and Great Teacher Onizuka. Bari Bari Densetsu and Rave Master. Mister Ajikko and Ace of Diamond. And here's the Shonen Sunday stamp sheet. Gu Gu Ganmo and Major. Mobile Police Patlabor and Flame of Recca. Ushio and Tora and Project ARMS. Ghost Sweeper Mikami and Kekkaishi. Case Closed and Hayate the Combat Butler.